Demonstrators gathered across the country. One person was shot and hundreds were arrested as anti-Trump protests continued across the country for a third straight night. Police arrested 195 people overnight in downtown Los Angeles after a thousand protesters marched through the city until the early morning. According to the Los Angeles Police Department, 187 adults and eight juveniles were taken into custody for their unlawful conduct related to the demonstrations. Meanwhile, a gunman is on the loose in Oregon after a protester was shot during an anti-Trump demonstration early Saturday morning in Portland. The male victim was hospitalized with non-life-threatening injuries, police said. "In the early morning hours of Saturday November 12, 2016, a man was injured in a shooting on the Morrison Bridge during a protest march," Portland Police said in a statement. "Preliminary information indicates that a suspect was in a vehicle on the bridge and there was a confrontation with someone in the protest. The suspect got out of the vehicle and fired multiple shots injuring the victim." Police said officers near the scene provided medical aid until an ambulance arrived and transported the victim to a Portland hospital. Police said the suspect fled the area, likely in the vehicle described as a gray or silver sedan. The suspect is described as an African-American male, late teens, 5 feet, 8 inches tall, thin build, wearing a dark-colored hooded sweatshirt and blue jeans. (@RedHeadNomad/Twitter) Cole Howard posted this photo to Twitter, Nov. 12, 2016, with the caption, "Shots fired. 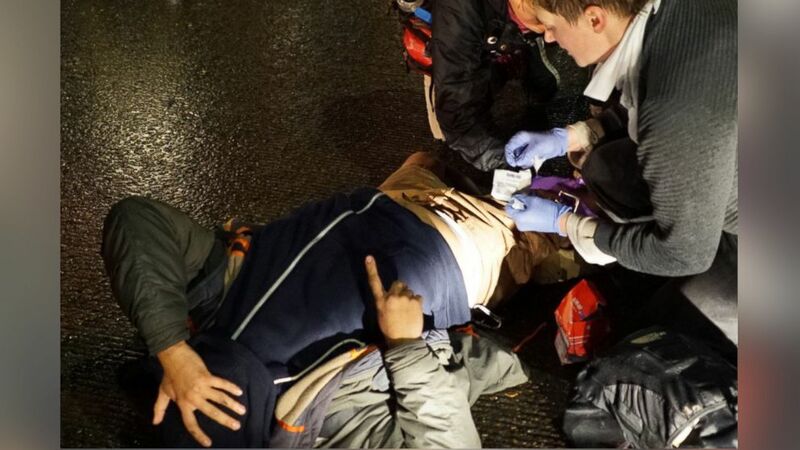 A protester was shot on the Morrison bridge by a car of civilians unaffiliated with the #pdx #NoTrump." (ANKUR DHOLAKIA/AFP/Getty Images) A protestor gestures at police at Pioneer Square in Portland, Oregon on November 11, 2016, to protest the election of US President-elect Donald Trump. 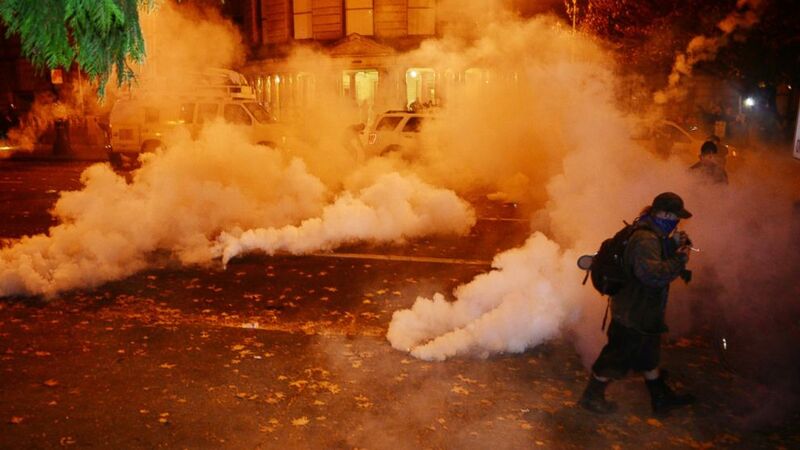 Riot gear-wearing police in Portland began using tear gas and flash-bang grenades around 9:30 p.m. Friday to disperse protesters who were throwing burning projectiles at officers, disrupting traffic and spray-painting graffiti. Protesters initially gathered at city hall at 5 p.m. to express their disdain for the Republican president-elect. (ANKUR DHOLAKIA/AFP/Getty Images) Protestors gather at City Hall in downtown Portland to voice their opinion following the US elections on November 11, 2016. At one point in the evening, police said about one group of 1,000 people were marching through downtown Portland. There are various splinter groups of protesters across the city. According to ABC affiliate KATU, at least two people have been taken into custody. The unrest follows Thursday's protests, which left more than $1 million in damage at local businesses, according to ABC affiliate KATU. The violence, though, is not representative of all the groups involved with the protests. Greg McKelvey, the organizer of Portland's Resistance, told KATU that he and his group were not involved in the violence. In fact, the group has started a GoFundMe page to help local businesses damaged in the riots rebuild. They've raised more than $30,000 so far. About 4,000 protesters gathered in Washington Square Park Friday for a "love rally," WABC reported, adding that most of the demonstrators were young women. 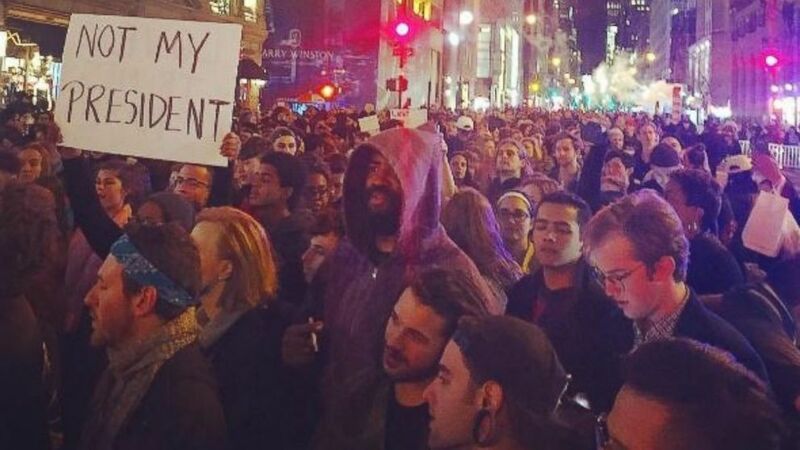 "I'm not expecting anything to change, I realize that Trump is our president-elect, I think that people are feeling a collective sense of grief and despair, it's a grieving process," protester Dana Nicolette told WABC. Protesters also descended upon nearby Union Square and then marched through midtown Manhattan. And many protesters headed to Trump Tower on Fifth Avenue, where they were met with a heavy police presence, concrete barriers, and sanitation trucks acting as barriers blocking the building. Eleven protesters were arrested for disorderly conduct, according to the NYPD. (@jberg11/Instagram) Protesters fill Fifth Avenue near Trump Tower in midtown Manhattan on Nov. 11, 2016, during anti-Donald Trump demonstrations. Anti-Trump protesters were met by counter-protesters in Dallas, who gathered outside of an anti-Trump protest and told the crowd to accept the election results. Hundreds of #NotMyPresident protesters -- representing Black Lives Matter, as well as LGBT, feminist, Muslim, immigrant, and environmental groups -- disrupted traffic at Biscayne Boulevard, the MacArthur Causeway and Interstate 95, reported ABC affiliate WPLG. Protesters chanted "Black Lives Matter," "Love Trumps Hate," "My body, My Choice," "U.S.A., No Trump, No KKK," "No racist U.S.A." and "Not My President." Hundreds also gathered at the city's Bayfront Park. 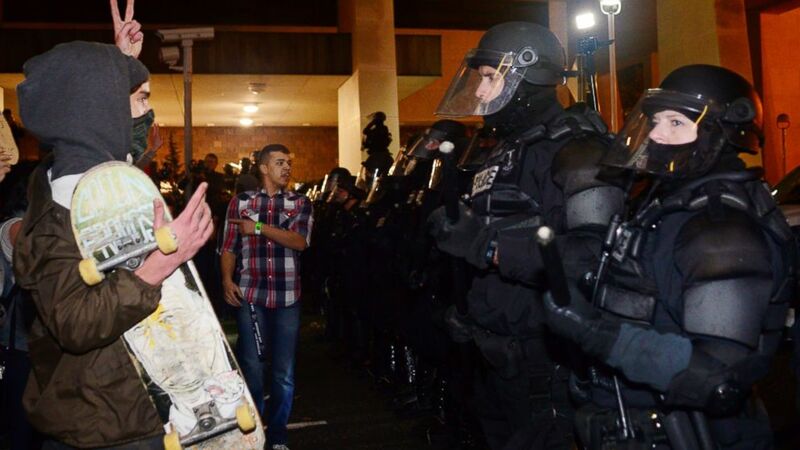 Police said residents at luxury condominiums overlooking Biscayne Bay threw things at protesters from their balconies, resulting in injuries. ABC News' Rex Sakamoto, Julia Jacobo and Alexandra Faul contributed to this report.